I am one of those 11 people known to have a Greyhound tractor (See Craig Detwiler's notes - 1929 Greyhound). 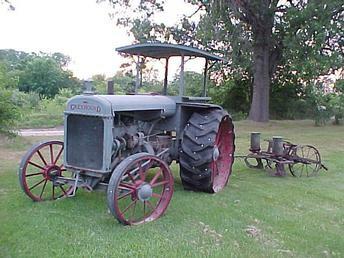 This is my Grandfathers' first tractor after my grandparents married. It has sat for many years in a barn where I climbed and played on it growing up. Today, it runs fine and I'm slowing restoring it. I have bolted tractor tread to the wheels for running it in local parades and shows. It's been a great family tractor - and a conversation piece.